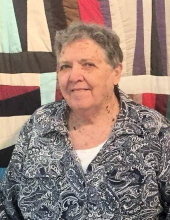 Stella Elizabeth Cheek, 87, of Americus died Thursday, April 04, 2019 at Magnolia Manor. A native of Baker County, she was born August 16, 1931 to the late Ben James Flournoy and Thelma Louise Beauchamp Flournoy. She was a member of Leslie United Methodist Church. She was a wonderful cook and seamstress; and enjoyed spending time with and doing things for her family. Funeral services will be held at 3:00 p.m., Saturday, April 6, 2019 at Greg Hancock Funeral Chapel in Americus with Dr. Joe Beauchamp officiating. Burial will follow in Sunset Memorial Gardens. The family will receive friends beginning at 2:00 p.m., an hour prior to the service at the funeral home. Survivors include her daughter and son-in-law, Lila and George Centerfitt of Leslie; son and daughter-in-law, James and Beth Cheek of Leesburg; a sister, Leila Gregoire of Jacksonville, FL; and two brothers and sisters-in-law: Ben and Linda Flournoy of Tifton, and Ernest and Judy Flournoy of Camilla. Also surviving are six grandchildren: Rebecca Dent, Elizabeth Murphy, Meghan Norton, J.T. Cheek, Maggie Cheek, and Anne Chaplin; and seven great-grandchildren. In addition to her parents, she was preceded in death by two sisters: Mary Dalton and Sally Jean Flournoy; and a brother, John Flournoy. The family suggests memorial contributions be made to: The League of the Good Samaritan, 2001 S. Lee St., Americus, GA 31709 or to Phoebe Sumter Hospice, 126 US Hwy 280 W, Americus, GA 31719. To send flowers or a remembrance gift to the family of Stella Cheek, please visit our Tribute Store. "Email Address" would like to share the life celebration of Stella Cheek. Click on the "link" to go to share a favorite memory or leave a condolence message for the family.